This hard-working charity has just won a massive fight – but they shouldn’t have had to waste so much time, energy and funding on fighting for better care for us. After years of campaigning to lower the age when bowel screening is offered (when other countries already offer this), they have finally made the Dept. Health see sense. It was confirmed that Bowel cancer screening age is to lowered to 50 in England and Wales. But, one can’t help wondering if the Dept. Health’s climb-down was fuelled by a previous Minister contracting the disease? Andrew Lansley, when Minister of Health, used to look down his nose whenever I bought up the question of earlier screening to bring us in to line with current thinking, in countries with a better cancer survival rate. “It’s not the NHS way” he would say. Bet he’s feeling different now it’s realised his cancer would have been caught earlier if UK had same diagnostic programme as other countries. Talk about ‘biter bit’. England and Wales have announced they are lowering the bowel cancer screening age from 60 to 50, apparently following a recommendation from the UK National Screening Committee. Earlier this year, Lauren Backler handed in her change.org petition signed by half a million people to the then Secretary of State for Health and Social Care, Jeremy Hunt MP, calling for this change in England. Previously, you weren’t invited to take a test until you were aged 60 – 74, but following a review of evidence, it was recommended that screening should be offered from aged 50 to 74. Using the new and more accurate screening test, the faecal immunochemical test (FIT) at a sensitivity level of 20ug/g. FIT at this level has the potential to detect twice as many cancers and four times as many adenomas. 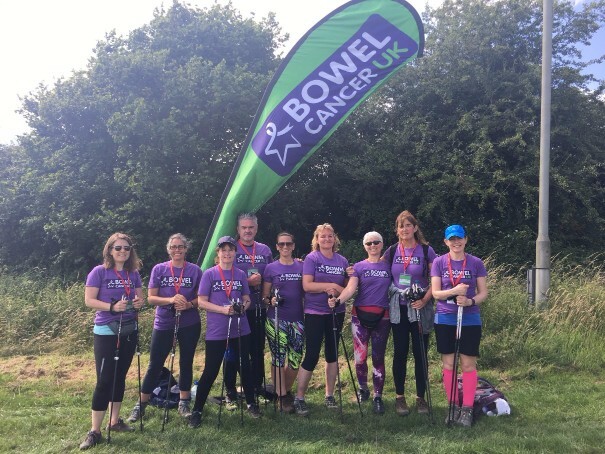 Deborah Alsina MBE, Chief Executive of Bowel Cancer UK, said: “We want to see every eligible person in the UK have access to the most effective screening methods. Today’s recommendation to offer FIT from the age of 50 every two years, with the ambition to increase the sensitivity of the test over time to 20 ug/g, is a significant step towards achieving this. We have campaigned strongly for the screening age to be lowered to 50, in line with Scotland and the rest of the world, for some time now, so we are delighted to see this has been recommended in England and Wales. If you are 50 or over, you should shortly receive a test package to carry out at home. It’s simple to do, and a life-saver when one considers what could happen if this cancer lies undetected. It will contain simple instructions including a dipstick to stick in your poo, a card on which to wipe it and a stamped addressed envelope in which to return it. Simples. Look out for this lot and their friends, who will be out fundraising on Sept. 1st. Now they have lowered the age for testing, they will be beating the drum for better recognition of those even younger who present with this disease.